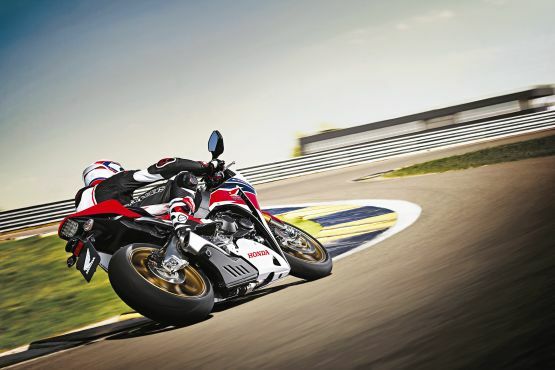 This most racy of Fireblades is certainly at home on a track, and it doesn’t lose out too much in practicality. Its single seat allows the rear sub-frame to be lightened, saving one kilogram and bringing wet weight to 199 kg (210 kg with ABS). In other respects the SP is a typical Fireblade, with an efficient digital instrument panel, excellent finish quality and striking, HRC-inspired paintwork. As to whether the Fireblade loses out by not having a good traction control system, personally I’d say, ‘yes’, but you can make up your own mind about that. The shrinking super-sports market seems to be polarising into two groups, with most manufacturers putting their effort into creating hugely powerful bikes with high-tech electronics aimed at helping the rider keep it under control. Then there’s the traditional method of development, aimed at creating high but not excessive horsepower with the emphasis on the way it’s delivered, and a chassis whose aim is to help the rider use brain and right wrist, not electronics, to go fast. The Fireblade has long been the leader of this group — generally scoring well in comparison tests despite a relatively Stone-Age specification — and the SP takes Honda’s approach to a new level. The SP is definitely the ultimate Fireblade. It’s fast, refined and sweet handling; very well-equipped in some areas, although less so in others. Whether it’s the ultimate Sport Production machine depends on what you want and expect from a cutting-edge superbike.